Filtration is a necessary part of aquarium maintenance, and it is a very important part of keeping fish. Aquariums can be messy, and through natural processes a fish tank can become harmful to its inhabitants. Proper filtration removes uneaten food, fish waste, plant detritus, and odor, while also aerating the water to remove carbon dioxide. With a variety of filter styles available it can be challenging to determine the best fit for a tank. When searching for the right aquarium filter consider the size of your tank, as well as the species and quantity of fish and live plants that will call the tank home. Some species of fish are naturally messy and require a high level of filtration. Fish tank filters generate a current. This movement of the water is necessary for some species of fish, but can be harmful to others. For example, betta fish do well with minimal current. There are different ways a fish tank filter cleans water. Mechanical filtration removes solid particles from the water, such as fish waste and uneaten food. Chemical fish tank filtration removes odors. Biological filtration uses bacteria to rid the tank of dangerous ammonia. Some filters offer all three forms of filtration, while others may offer one of two methods. An aquarium undergravel filter system offers excellent biological filtration. Depending on the specific model an undergravel filtration system may also offer mechanical and/or chemical filtration. 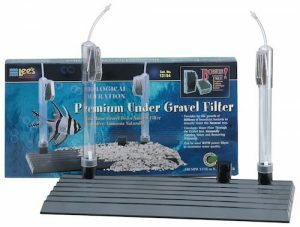 Oftentimes, an under gravel filter works well when paired with a powerhead filter which will provide increased power and another form of filtration. An undergravel fish tank filter features a flat plate that is placed on the bottom of a tank. Gravel is spread out over the top of the plate. Under gravel filters work by pulling water through the intake in the plate and the gravel that rests on top of the plate. This system utilizes the gravel for biological filtration, similar to how water is cleaned in nature. The gravel will host beneficial bacteria that works to convert ammonia, which is a harmful byproduct of fish waste, into nitrates, which are much more safe. The water is then pumped through tubes that bring the water to the surface. There may be additional filter mediums present in the filter housing that further clean the tank water. Water re-enters the tank at the surface. This process creates movement, and it also aerates the water. 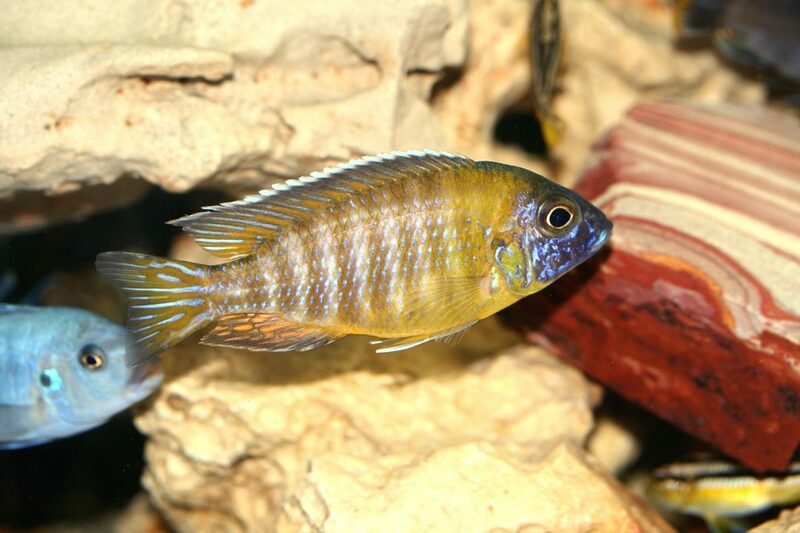 A major advantage of an undergravel aquarium filter is the large surface area of the water intake. This eliminates dead spots, and ensures most, if not all, of the tank water is pulled through the filter. When the return and intake are nearby one another there is the possibility that the same clean water will continually run through the filter. Since there is a large distance between the water intake and the water return there is no chance of clean water immediately being pulled back into an undergravel filtration system. Whatever size tank you have you are sure to find one of Lee’s Premium Undergravel Filters to fit. This filter comes in 9 different options, ranging from 5.5 gallons to 135 gallons with several sized to fit small or long tanks. Larger plate sizes cover a big area, allowing for the use of fewer plates. The multi-level plate design offers biological filtration, so dangerous ammonia is converted to nitrites, and eventually nitrates, creating a safe environment for fish and live plants. Chemical filtration via the included carbon cartridges removes odors and prevents discoloration. All of the aquarium undergravel filters in this series are constructed from a special quality plastic that resists cracking and splitting for long-term dependability. Molded gravel guards prevent gravel from falling into the uplift tube, and keeps the filter functioning properly. The height of the dual uplift tubes can be adjusted to fit a variety of tanks. Water is oxygenated as it is released from the uplift tube for added convenience. This filter includes carbon cartridges, along with coarse Discard-A-Stones, and a Lee’s fish-saver elbow. The openings in the filter to pull water into the plate are sometimes blocked out of the package due to a manufacturing error. This can be fixed by going through with a knife and clearing the water intake openings. Undergravel filtration systems offer excellent biological filtration to remove harmful ammonia from fish tanks. Water is pulled through gravel which naturally fosters the growth of good bacteria for a clean and safe aquarium. 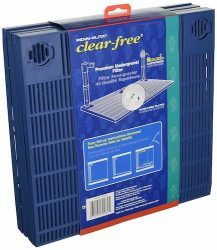 Lee’s Original Undergravel Filters support a large selection of tank sizes, ranging from 2.5 gallons all the way up to 150 gallons. With 13 different sizes, including several small and long options, there are a wide array of filters to fit a variety of tanks. Made using a special quality plastic, these filters stand up to long-term and heavy-duty use. The 1″ diameter dual uplift tubes can accommodate a large flow of water for improved circulation, while the adjustable design allows for flexible installation options. The optional flow-thru set up makes it easy to team this undergravel filter with a powerhead for improved filtration and tank maintenance. This aquarium undergravel filter includes airline tubing, Discard-A-Stone, and a Fish-saver elbow for ease of setup. This filter supports separate plate installation, allowing for use in various configurations, like odd-sized tanks. The separate plate installation is not always ideal. In a regular shaped tank the plates may not cover the entire bottom. Spaces between the separate plates will not offer continuous coverage and filtration, and may be prone to the growth of harmful bacteria or algae. The Penn Plax Gallon Aquarium Premium Under Tank Filter comes in three sizes, 10 gallon, 20 gallon, and 40/55 gallon to fit a variety of tanks. The flow through plates create a level surface and allows for water to easily be pulled into the filter. Dual lift tubes feature a 1″ diameter to quickly and easily move water. The lift tubes are adjustable, to fit tanks of varying heights. This fish tank undergravel filter features two levels of filtration. The movement of water through gravel facilitates biological filtration. This system also supports chemical filtration via the included easy-to-use Filt-A-Carb cartridges. This filter media is installed at the top of the lift tubes for easy access and simple maintenance. The activated carbon in these cartridges removes gases, odors, and prevents discoloration, to keep your tank clear and clean. This filtration system requires some assembly to set up. For the 20 and 40/55 gallon models the clips that hold the plates together to create a continuous plate surface are not very secure. When the plates drift apart gravel can become lodged underneath the plates, which makes them uneven. The Penn Plax undergravel aquarium filter is not very powerful. For some set ups this may be fine. When used in conjunction with a powerhead it is possible to improve the performance. 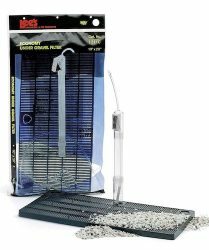 Lee’s Economy Undergravel Filter uses biological filtration to cleanse tank water of ammonia and create a safe habitat for fish. This setup also features carbon filtration to remove discoloration and odors. This undergravel filter comes in 6 different options. The smallest size is intended for 5.5 gallon tanks, while the largest capacity accommodates 40/55 gallon tanks. Several options are intended for small or long tanks for a custom fit. The plates are made from a semi-flexible, break-resistant plastic which delivers dependable long-term results. The flat-plate design ensures even and steady placement of the plate in the tank, as well as for plants and decorations set on the base. The modified design features an increased open space on the plates to improve water circulation. The 1″ diameter uplift tube pulls water from the bottom of the tank and returns that water at the top to oxygenate the water. The uplift tube features an adjustable design, allowing for a custom fit in tanks of different heights. This filter kit includes a Fish-saver elbow, coarse Discard-A-Stone, and an original carbon cartridge. 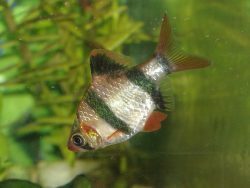 This filter works best in aquariums that have one large fish or several small fish. This undergravel filtration system does not have enough power to support other configurations. This filter can be used in tandem with other filters for improved performance; however, the single uplift tube limits the functionality of this system. 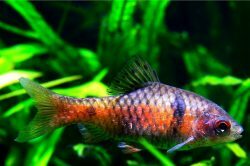 When determining the best undergravel aquarium filter for your setup consider how often the water in the tank needs to be turned over. This depends on the size of the fish tank, along with the type and quantity of fish, and live plants. It is important that the filter can accommodate the amount of water that has to be processed. 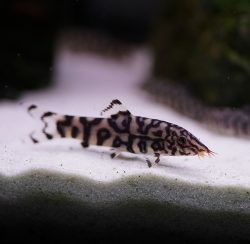 A messy aquarium can be fatal to fish, but if the filter does not meet the needs of the aquarium, or if it is too powerful and over processes the water it can pose a danger to the inhabitants. The best undergravel filter excels at biological filtration, so when using this type of filter it may be necessary to also use another filter that will offer better mechanical and chemical filtration. 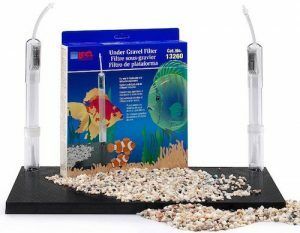 Undergravel fish tank filters use gravel as a filter media, so it is necessary to clean the gravel on a regular basis the same way sponges or media in other styles of filters would be cleaned or replaced. Different types of gravel, including air rocks are available, and can impact the effectiveness of the filter. Please comment on this post with any questions, feedback, or firsthand experiences you would like to share.